In 2015, Vernell received news that he needed a heart transplant. His doctor told him to pack his bags – he required hospitalization while he waited for a new heart. He suffered from congestive heart failure and spent six months in the hospital waiting for an organ donor. The wait was difficult for Vernell and felt much longer than six months. Due to the extended hospital stay, Vernell required rehab so he could learn to walk again. During this time, Vernell also went into kidney failure and found out that he needed a kidney transplant, too. Finally, Vernell was told that a heart was available. He was thrilled and could not believe that the wait was finally over. However, the next day, his doctor told him that the heart was not suitable for him. Vernell was devastated and began to lose hope. The following week, his doctor presented him with great news – a heart and a kidney were available. He was told to prepare for surgery. Vernell received a heart transplant, and the following day, received a kidney from the same donor. A year after his transplant, Vernell had the opportunity to exchange letters with the mother of his organ donor. He found out that his donor, Victor Startek, was a 27-year-old who passed away from an asthma attack. Vernell sent his mother cards for Mother’s Day and her birthday. For Christmas, he sent her a bear that plays the sound of his beating heart. 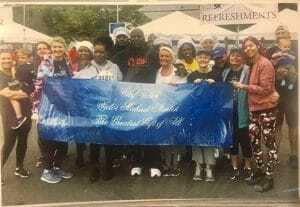 Vernell met Victor’s mother and twin sister at a “Celebration of Life” 5K in New Jersey. He was initially very nervous about the meeting, as his emotions were a combination of gratitude and guilt. Victor’s mother gave Vernell a glass globe that contains some of her son’s ashes. Vernell keeps in touch with the family via Facebook. He is forever grateful for the gift of life that he was given. Have a story to tell? Contact us!